At 4:30 p.m. on April 8, 1826, near the Chain Bridge on the Virginia shore of the Potomac, the United States secretary of state kept an engagement with a famous United States senator from Virginia. The cabinet officer had not come to chat; this was not a social call. He had not come to conduct business; this would not be a policy discussion. As the waiting senator knew, this encounter would be utterly straightforward, even primal: the secretary of state was coming to shoot him. Though the participants on this occasion were unusually exalted, a visit to the field of honor was hardly rare for American gentlemen, especially from the 1770s to the Civil War. 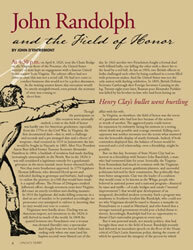 In Virginia, the first documented duel—that is, with a challenge and seconds and a pre-arranged date and a choice of weapons—had occurred in 1619 in Jamestown; the last would be fought in Fincastle in 1883. After Vice President Aaron Burr killed former Treasury Secretary Alexander Hamilton in 1804, a backlash of revulsion had made dueling increasingly unacceptable in the North. But in the 1820s it was still considered a legitimate remedy for a gentleman’s grievance in the more martial, more honor-obsessed South. John d’Entremont is Theodore H. Jack professor of History at Randolph College in Lynchburg, Virginia, where he has taught for twenty-seven years. He is concerned most centrally with Southern and Virginia history, women’s history, and the history of reform and social change. His book Southern Emancipator (Oxford University Press, 1987), a biography of Virginia-born abolitionist Moncure Conway, won the Allan Nevins Prize of the Society of American Historians, the Gustavus Myers Prize, and was nominated for the Pulitzer Prize in biography. He was the co-curator of the Virginia Historical Society’s first permanent exhibit, “The Story of Virginia: An American Experience.” The author of numerous essays and reviews, he is currently completing a history of Virginia from the dinosaurs to the present, “Endowed by Their Creator”: The Story of Virginia in the Saga of America.